Sync2 Cloud Pro. Sync Microsoft Outlook with multiple sources: Google, Android, iCloud, iPhone, Microsoft Exchange or Office 365 accounts. 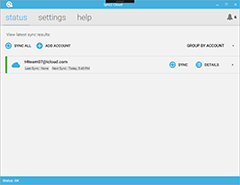 Sync Outlook data with multiple sources: Google, Android, iCloud, iPhone, Microsoft Exchange or Office 365 accounts. Sync2 Cloud Pro edition is the synchronization tool to sync Microsoft Outlook data with multiple online sources: iCloud (iPhone, iPad), Google (Gmail, Android), Microsoft Exchange (Office 365). With Sync2 Cloud Pro edition you can synchronize your data automatically or manually between multiple accounts and cloud sources, and Microsoft Outlook. Facebook, Yahoo and other popular sources are coming soon. Synchronize Microsoft Exchange Calendar, Contacts and Tasks with Microsoft Outlook. Sync single or multiple Microsoft Exchange accounts. Synchronize your Microsoft Outlook Calendar, Contacts and Tasks with Google. Choose between one- or two-way sync. Synchronize your data manually or set up automatic synchronization at predefined time intervals. Using Sync2 Cloud Pro version you will be able to synchronize your Outlook data manually as many times as you want. Synchronize Outlook any time you want. Schedule synchronization and it will be done automatically without your interference. Start synchronization manually at any time you want without opening Outlook. Complete automatic background synchronization, even if Outlook is not running. Sync2 Cloud will synchronize data without interrupting your work. Once set up, synchronization will run at the scheduled time in the background regardless of whether Outlook is running or not. Instant sync after changes are made in Microsoft Outlook. Your data can now be synchronized instantly after any changes in Outlook. You can be sure that changes you make in Microsoft Outlook will appear on the selected sources immediately. Instant sync is turned on by default, but it can be disabled from the settings if you do not want it.